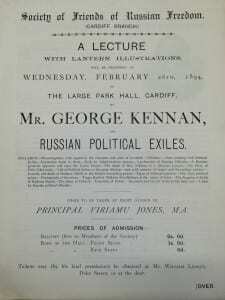 In another sense, however, Kennan was a fully fledged member of the revolutionary movement. 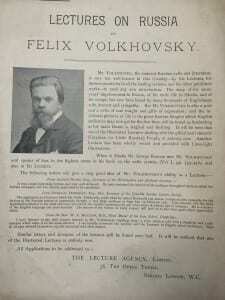 His writings appeared in Russian on nine different occasions between 1888 and 1891. Around this time, his name figures repeatedly in the memoirs and recollections of Siberian political exiles. Vladimir Burtsev, who escaped Siberia and fled to Europe in 1888, wrote subsequently that upon arriving in Switzerland his aim had been to ‘write a history of the revolutionary movement somewhat in the style of Kennan’s’ (Burtsev 2012, p. 53). The early Soviet journal Katorga i ssylka (Hard Labour and Exile) wrote in 1929 of one exile advising another, in the aftermath of a massacre of political prisoners in Iakutsk on 22 March 1889, to ‘write of this to all corners of our motherland, the borderlands and abroad, to every Kennan’ (Katorga i ssylka 52 (1929), p. 37). 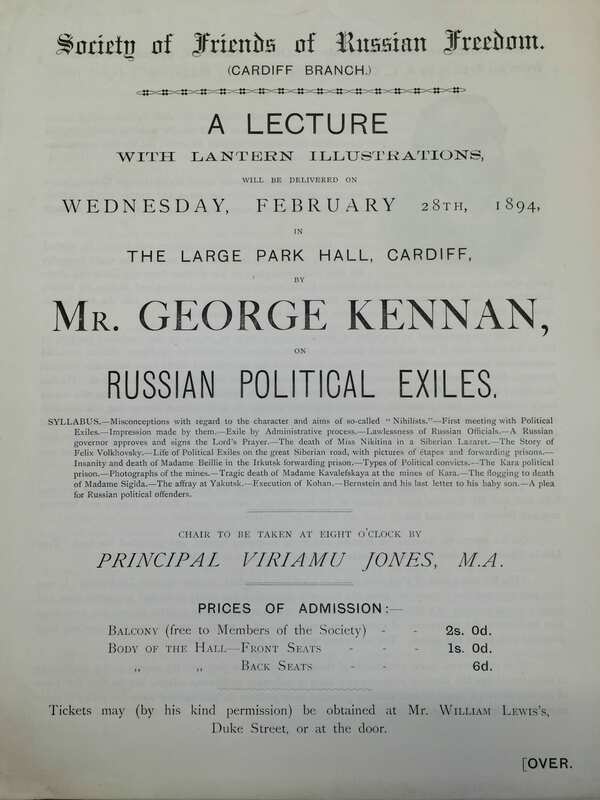 Ivan Meisner, writing from the Sakhalin penal colony later that same year, suggested that his correspondent ‘could scarcely imagine the joyous surprise that possessed us upon learning of Kennan’s agitation, of that explosion of anger that shook all educated Europe and America after the executions in Iakutsk and the horrors of Kara’ (ibid., p. 38). Advertisement for a lecture by Volkhovskii. Herein lay Kennan’s significance for the revolution. For a movement that entered the fin de siècle shattered by the repressions that had followed Aleksandr II’s assassination in 1881, all but devoid of ideological coherence and plagued by factionalism and infighting, the experience of banishment – whether in the West or in Siberia – became the cornerstone of a common identity through necessity. ‘The heroes of the emigration were the revolutionaries fighting the government and working amongst the working class’, Burtsev wrote. ‘As our enemies expressed it, they were all katorzhniki [hard labour convicts], those who remained in prison and exile. To his own question – what was a Russian intellectual? – the centre-right journalist Meshcherskii replied that it was a man who had served a prison term’ (Burtsev 2012, p. 35). Yet for the western émigrés to plausibly appropriate the label for their own ends was difficult without genuine channels of communication to Siberia. Before Kennan and the arrival of such escapees as Volkhovskii, Burtsev and Leonid Shishko, these were few and far between. Most of the latter, with the notable exception of Volkhovskii, were almost entirely unwilling to write or speak of their experiences – a subject for another post – whilst others, such as Stepniak and Petr Kropotkin, did not do so from personal observation. It was left for Kennan not only to propagandise the Siberian cause celèbré from a position of personal experience, but to make exile – whether self-imposed or judicial – synonymous with the radical cause, thereby drawing the revolution’s east and west closer together. Ben Phillips is a PhD candidate at UCL SSEES. His research focuses on images of Siberian exile in pre-1917 émigré literature and the construction of affinities between Russians’ eastern and western experiences of banishment. He currently holds a visiting fellowship at the Library of Congress in Washington DC, where he is working on George Kennan’s connections with the Russian emigration.